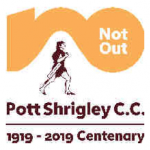 Pott Shrigley C.C. was formed during 1919, when there was an upsurge, countrywide, in forming and reforming Clubs and Societies, many of which had been disbanded or suspended, due to the First World War. The estate of local landowner Col. Lowther, covered most of the village. He was approached by several locals with a view to using a small piece of his land as a cricket ground. This he agreed to do, giving part of the old Pott Shrigley Golf Course to be used by the villagers for one shilling per year. The pitch was sited on one of the old greens. Original stalwarts were Frank and George Tinsley, Ted Lidbetter, George and Charlie Cooper, Hugh Mayers, Headley Snape, Walter Kirkham, Alf Gardiner, William Leigh, Lew Roberts, Isaac Cooper. Archie Brown was another, who helped lay and cut the first wickets. Archie continued playing until he was well past 80 years of age. “Pott Shrigley C.C. met the Manchester Ramblers last Saturday. The score was Pott Shrigley 53 and Manchester Ramblers 42. The weather was favourable and there was a good gathering of spectators. The second item discovered was a report of the 1921 AGM. Col Lowther was made President with the Secretary being Jack Kirk. Treasurer was A. Harding with Harry Burt being Captain aided by Frank Tinsley as Vice Captain. Early fixtures were played against local village teams plus a sprinkling of larger club Second XI’s, works teams and Church or Sunday School sides. The Churches had a long tradition and involvement in the organising of local sport. By 1924 the Club had joined The Adlington & District Cricket Association. This was a small local league, so friendly fixtures were interspersed with League games to ensure a full fixture list. The first two seasons saw the Club struggling at the bottom of the League but over the next 10 years Pott Shrigley won nine titles in the 2 divisions. During the late 40’s and early 50’s much of the running of the Club fell on the broad shoulders of Geoff Harding who lived opposite St. Christopher’s Church in the village centre. The arrival of Fred Wrigley and Derrick Brooke in 1950 gave the Club a fresh impetus. Next came pitch improvement. Brothers Joe and Graham Higginbotham decided to turn the square and enlargement of the playing area followed. 1966 saw the Club adopt the ‘Hillman’ as the central figure of the Club crest. This came from an amusing article in the Daily Express recounting Pott Shrigley’s Second XI fixture with Lindow. Shrigley were pictured as muscle rippling Hillman in an exciting game that see sawed until the last ball. Alan Edworthy, then Sunday Captain insisted on incorporating the figure into the Club culture. 1968 saw us joining the Cheshire Club Conference. Though Club’s still arrange their own fixtures. The next eleven years were the Club’s most successful with Nine Conference titles plus the locally prestigious Macclesfield Express Cup in 1977, with several David v Goliath encounters. Derrick Brooke, Keith Arnold, Alan Sherratt, Ken Barlow, Don & Graham Hackney, Alan Beckett, Martin Tute all played their part. The Club was probably at its strongest during the 1970’s, but more and more Clubs wanted a proper League structure and so the Cheshire Cricket League was formed in 1977. Our Committee felt that to guarantee standards of fixtures and continue to improve we had to join. This we did the following season. Since joining the C.C.L. success has been sparse. Though there have been many record breaking performances they have tended to be set by individuals, rather than the team as a whole. The one area that has seen Honours on a regular basis is the thriving Junior section. Now being run by Junior Coach and Manager Andrew Hart, 2012 has seen the undefeted Under 11s side lift the High Peak Junior League title. Now all we need to do is transfer that to the Senior XI.